In the spinoff series, Fuller House, life can take you into unexpected directions and also back into familiar territory when veterinarian and recently widowed D.J. 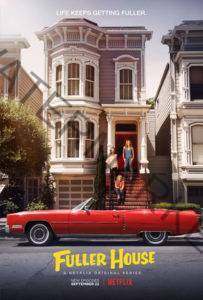 Tanner-Fuller finds herself living in her childhood home with younger sister and aspiring musician Stephanie Tanner and DJ’s lifelong best friend/fellow single mother Kimmy Gibbler. The women reuniting to help support one another navigate careers, parenting and relationships with the kind of love and humor you can only get from the people you grew up with. The Tanner childhood house is fuller than ever though with not only DJ’s three boys — the awkward 13-year-old Jackson, neurotic 7-year-old Max and baby Tommy Jr. — but also Kimmy’s feisty teenage daughter Ramona and Kimmy’s not so estranged ex-husband Fernando all under the same roof. Returning for its second season, the family experiences a new year of life’s moments big and small from the start of a new school year, to budding romances to coming together for the holidays. There’s nothing like spending Halloween, Thanksgiving, Christmas and New Year’s with the people you love, because life is fuller with family. Fuller House stars Candace Cameron Bure as D.J. Tanner-Fuller, Jodie Sweetin as Stephanie Tanner, Andrea Barber as Kimmy Gibbler, Juan Pablo Di Pace as Fernando, Soni Nicole Bringas as Romona, Michael Campion as Jackson, Elias Harger as Max, Dashiell and Fox Messitt Twins as Baby Tommy, Scott Weinger as Steve Hale, John Brotherton as Matt Harmon, and Ashley Liao as Lola.Bob Boyett and Jeff Franklin serve as executive producers. Fuller House is produced by Miller-Boyett Productions and Jeff Franklin Productions in association with Warner Horizon Television for Netflix.